My mother was a keen Mothercare fan in the 70’s when her kids were born. Back then, Mothercare was only available to Malaysians via catalog. Which means mum had to select what she wanted through a catalog, then mail her order direct to Mothercare in the UK. She’d wait patiently for her goodies to arrive, but my Dad was not so keen (hahaha he was the one sending cheques every month!). She still remembers opening her packages with glee and oohing and aahing at the quality of the clothes. So much so, when my turn came almost 2 years ago to have a little one of my own, I was thrilled to pay them a visit in one of the KL stores! I could finally go check out what my mum had been raving about! Everytime we’d go shopping for baby stuff, my mum would say, “when you all were babies, you were all in Mothercare, you know.” So off we went to Mothercare to buy this and that for my little one. They are a well-stocked store with loads of great baby things, and trust me, you can easily get carried away in there! As my son grew, my time in Mothercare also grew. That’s the beauty of Mothercare – you can still shop there when bubs gets bigger. There are educational toys, activity toys for all ages, clothes for toddlers and older kids, shoes, books, swim gear and so much more. When I was living in Sydney, I too, visited Mothercare a fair bit, and now that we are back in KL again, I don’t know what I’d do without my favourite store. 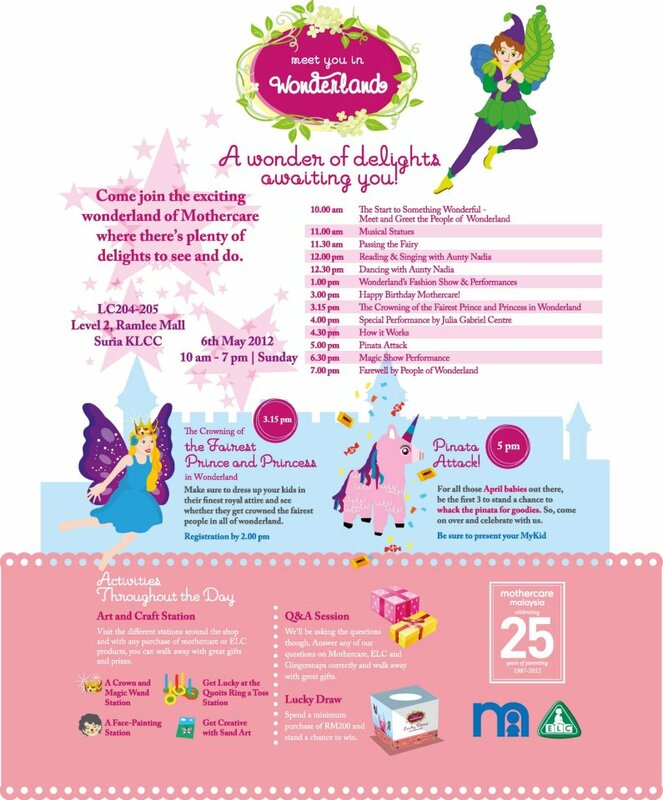 This 6th of May at the Suria KLCC store, Mothercare is celebrating their 25th Anniversary in Malaysia with loads of fun and games for all! There’ll be play time, activity time, face painting, fairy princess dress up, costumes, magicians, cake time (what’s a birthday without a cake? ), and plenty more. Please see below for the e-flyer. But here in Asia, Mothercare is thriving more than ever! From the humble beginnings in 1997 at their first store in KL Plaza (now known as Farenheit 88), to 9 more stores across the country. If you would like to continually support them, please do come down to the celebration, and let’s hope for another great 25 years in Malaysia!